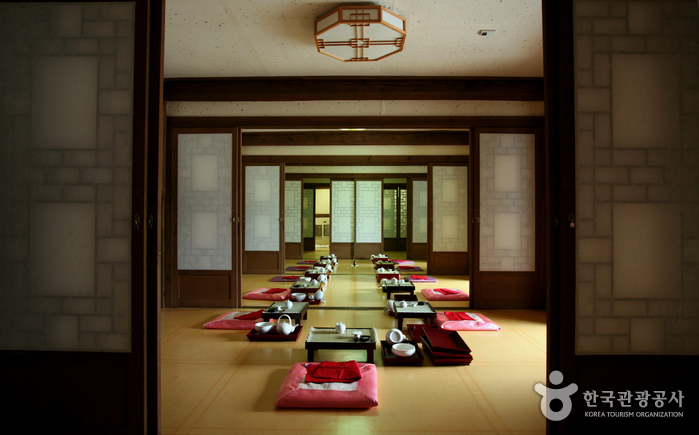 Have you thought of your stay in Hanok house? Hanok (韓屋) Stay refers to staying in a traditional Korean house. It is a good opportunity to experience traditional Korean lifestyle and culture. The traditional houses available for Hanok stays are decades to hundreds of years old. They have been somewhat renovated for the convenience and safety of its guests, but the traditional Korean style and sentiment are still retained. Today we introduce 2 Hanok houses in Gangneung whereby you can meet tradition and modernity at the same time. Gangneung Ojuk Hanok Village has made the most of the Hanok’s characteristics as much as possible to create a natural space. Although the design is lacking in ornamentation, it shows simplicity and innocence by making full use of the merits of the material, and the view of the bamboo planted throughout the town can calm your mind and body by looking at it. Around Hanok village, you can walk up to Ojukheon and Museum. It is a representative landmark of Gangneung which became famous with regard to Yulgok Yi I, a great scholar in the Joseon Dynasty, and his mother, Shin Saimdang. The Ojukheon Museum presents not only the aspect of Gangneung culture, which has been shaped by the geographical, human, and sociological environment from prehistory to today, but also tells the history and culture of Gangneung. Seongyojang is the former upper class residence of the Naebeon Lee (1703-1781) noble family of Gangneung-si, Gangwon-do. It was designated Important Folklore Material No. 5 in 1967. The meaning of “Seon”, in Seongyojang, is boat. Gyeongpo Lake was directly in front of Seongyojang at the time it was built, thus making is accessible by boat. Gyeongpo Lake at one time reached the enormous circumference of 12km. Its size has reduced by 4km over the years and its depth has decreased by 1-2 meters. It is said that 10 generations of descendents of Naebeon Lee have continued to live at Seongyojang. The house is in fact one of the top 10 most well preserved original dwellings in Korea that was constructed over the past 300 years. Do you know that 2 places above are the shooting location of <Saimdang, the memoirs of colors>? What can we explore more in Gangneung?